Getting Gamers: The Psychology of Video Games and Their Impact on the People Who Play Them is a book about how video games use psychology to shape our behavior, manipulate our beliefs, and rig our purchasing decisions. IT’S ON SALE NOW, YOU ALL! And lots of other places. Just search for “Getting Gamers” and you should find it. Why do normal people become raving lunatics online? Why do players cheat and peek at strategy guides? Why are fanboys and fangirls so ready for a fight? Why do we get nostalgic about good old games? How do games get us to keep score and compete? How do games get us to grind & chase achievements? How do games keep us excited for new loot? How do games immerse us in imaginary worlds? Why do we go crazy for digital game sales? How do mobile games get you with in-app purchases? How do games keep players paying and playing? How do games get players to market to each other? Do we shape our game avatars or do they shape us? Is video game violence a problem? Why do we like it? Do video games make you smarter? Jamie Madigan takes us as deep into the minds of gamers as is possible without a scalpel. It’s a fascinating and essential read. 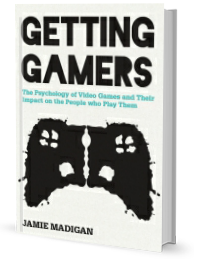 Jamie Madigan’s fascinating exploration of the psychology of gaming blends provocative research findings with lively anecdotes and witty prose. It is accessible, insightful, and a must-read for gamers and game designers. For those interested in the interplay between the science of the mind and the science of game design, there is no better place to begin than with this book. Jamie Madigan has put together something fun, engaging, and seriously interesting, and not just for people who love games, but for people who wonder why we can be so weird online or inside our social media. I guarantee you will come away from this book with not only a better understanding of human behavior, but with advice on how to apply the latest research in your own life and profession. For years now, Jamie Madigan has served as the unofficial psychologist of the games industry. If you want to understand how human behavior and games interact, this is the book for you. Jamie Madigan, PhD, has become an expert on the psychology of video games and seeks to popularize understanding of how psychology can be used to understand why games are made how they are and why their players behave as they do. Madigan also writes, podcasts, and lectures on the subject for various magazines, websites, and his own site at www.psychologyofgames.com. He has consulted with game development companies and talked at conferences about how game developers can incorporate psychology principles into game design and how players can understand how it affects their play. Madigan has appeared as an expert on the psychology of video games in dozens of print, web, and radio outlets, including The Washington Post, Wired, The Atlantic, the Chicago Tribune, BBC Radio 5, the BBC, The Guardian, Oprah Magazine, Official Playstation Magazine UK, The Verge, Livescience.com, The Escapist, MMORPG.com, Kotaku, The Gameological Society, Sky News HD, the Cited Podcast, the You are Not So Smart podcast, and Polygon.